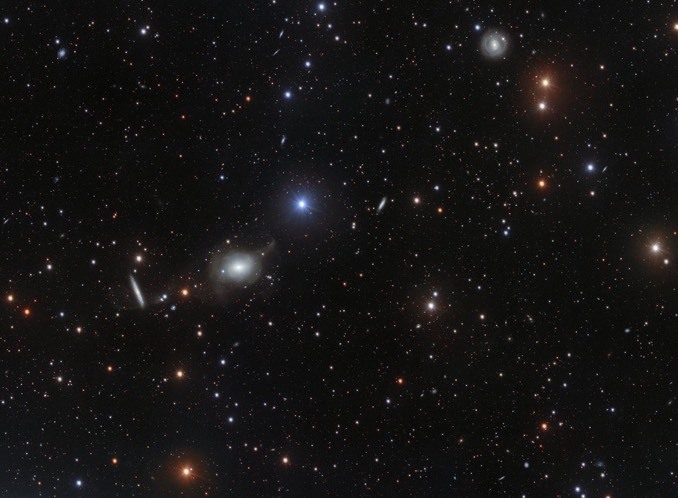 The European Southern Observatory’s VLT Survey Telescope and its OmegaCAM instrument captured this stunning 400-megapixel wide-angle view of a galactic neighbourhood in the constellation Virgo showing a “glittering host of galaxies” shining in the depths of space. An international team of astronomers used the VST to conduct a survey of early-type elliptical galaxies visible from the southern hemisphere, capturing an intriguing view of NGC 5018 near the centre of the image below that features a “tidal tail” of stars stretching away into space, an indicator of gravitational interactions with other nearby galaxies. The image also includes faint tracks left by two asteroids in Earth’s solar system along with a scattering of foreground stars in the Milky Way, including the brilliant blue star HD 114746 near the centre of the photo. The 256-megapixel OmegaCAM used with the VST features a 32-CCD detector to create images with 16 times more pixels than the Hubble Space Telescope’s Advanced Camera for Surveys. In this huge image of part of the southern constellation of Norma, wisps of crimson gas are illuminated by rare, massive stars that have only recently ignited and are still buried deep in thick dust clouds. 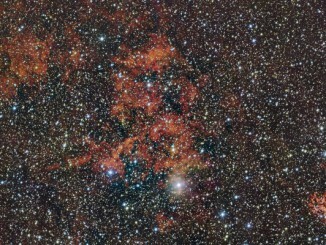 The vast nebula where these giants were born, known as RCW 106, is captured here in fine detail by ESO’s VLT Survey Telescope (VST), at the Paranal Observatory in Chile. 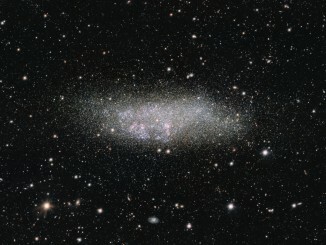 This image shows a lonely galaxy known as Wolf-Lundmark-Melotte, or WLM for short. Although considered part of our Local Group of dozens of galaxies, WLM stands alone at the group’s outer edges as one of its most remote members. In fact, WLM is so small and secluded that it may never have interacted with any other galaxy in the history of the universe. 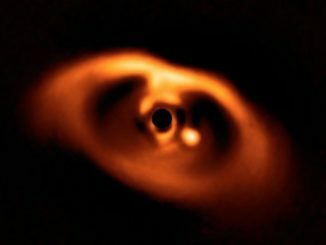 Astronomers have managed to spot a new planet in the process of forming in a dusty disk surrounding a hot young star. It is the first definitive observation of its kind, opening a new window in exoplanet research.